The snake has several esoteric aspects. The word Nāga (IAST: nāgá, Burmese nəɡá) is the expression for a god or for a class of snake-beings in Hinduism, Buddhism, Jainism and Sikhism. A female snake is called nāgī or nāgiṇī. Some representations of the snake resemble a dragon. In Hinduism the serpents (nāgas) symbolize different forms of manifestation of the cosmic Shesha kundalini snake. Nagas are often semi-divine and live in the various regions of the underworld (Patala) (see : Daitya's). A fiery Kundalini - form (Kula - Kundalini) of Shesha is dormant in man in the Ra - triangle of the Muladhara - Chakra. It rises by certain yoga processes. In its highly transformed form in the Sahasrara, it is also referred to as Kameshvari. In the swadhisthana chakra lives the Prana-Kundalini. A fish, a crocodile and a snake (Prana - Kundalini) are symbols of the characteristics of the Swadhisthana - Chakra. This chakra is the actual chakra of the pranic serpent forces (Prana maya kosha: dark material ether: letter U), for which certain cleansing techniques are practiced in Kundalini yoga. After the Yoga Kundalini Upanishad 1.82-84, the Kundalini snake takes its tail into the mouth like an Ouroboros. The Linga Purana counts 12 snakes as companions of the gods. Surasa is considered the mother of the single-headed snakes (Sarpas). 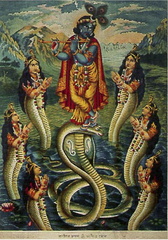 Kadru is the mother of the multi-headed Nagas of the Mahātala. The most famous are Ananta, the Naga king vāsuki and the snake king Takshaka. When Arjuna and Krishna were assisting Agni in the Mahabharata during the burning of the Khandava Forest, Takshaka 's wife died and Takshakas' son Aswasena succeeded to escape, who later tried to avenge his mother' s death at Arjuna. The snake king Vasuki is a participant in the whirling of the milk ocean. The eagle Garuda is regarded as an enemy of the snakes in Hinduism. Krishna dances fluteplaying in the Bhagavata Purana on the five heads of the mighty serpent demon Kaliya, a son of Kadru, who had previously defeated the Garuda, whereupon Kaliya escaped to the Yamuna. Mahavishnu's cosmic Shesha Naag is a huge serpent with 5 heads. In the Mahabharata, Brahma gives the Sheshha his blessing and the order to carry Prithvi or the earth. Indrajit, a son of Ravana, shoots arrows in the Yuddha-Canda of the Ramayana, which turn into snakes. The Mahabharata epic begins in the first book Adi Prava with the history of the Nagas (chapter: Paushya, Pauloma, Astika). In Mahabharata 1.57 seven snake races are counted. Naga women are highlighted as particularly beautiful (3,263) (4,9) (6,105). The Daitya - heroes Sunda and Upasunda defeat the Nagas (just like Ravana) in Mahabharata (3,289). After the Varaha-Purana, Brahma's son Kashyapa had four wives. Kashyapa's first wife bore the devas, the second the garudas and the third woman Kadru, the primal snake-mother in the Patala, bore the Nagas (1000 snakes). 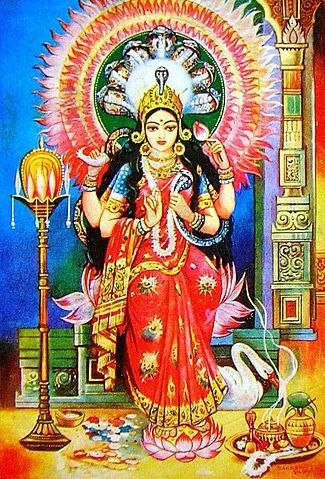 The Serpent goddess Manasa (intention, the mind-born) or Ma Manasa Devi is a Hindu guardian goddess, who is counted to the Nagas. Manasa is the sister of Sesha (Ananta) and Vasuki. She is considered a daughter of Kadru and Kashyapa, from whose mind she was born, or as an illegitimate daughter of Shiva. She is also considered a consort of the sage Jagatkāru (Jaratkāru). Manasa is depicted as a young jewel-adorned woman with a crown of seven cobras and sitting on a lotus. Her vahanas are snake and swan, and her attributes are water pot, snake, rosary and a manuscript. Other names of Manasa are Vishahara (destroyer of poison), Nityā (eternal) and Padmavati. Her Buddhist counterpart is the serpent goddess Janguli - Tara. The goddess is said to punish with wrathful snakes in anger, but also to heal or protect people from it. Therefore one of their surnames is also Vishahara (poison remover). In the Mahabharata she healed Shiva, who had swallowed the poison of Vasuki after the whirling of the milk ocean so that his neck was blue (Nilakantha). Other epithets are: Nagini, Nagesvari, Astikamata, Janguli (poison knower), Jagatgauri (beauty of the world), Patma (Lotus), Patmavati (the Lotus-born), Nitya (the Eternal) Nagamata (mother of the snakes), Shaivi, Vaishnavi, Nagabhogini, Yogeshvari (Mistress of Yoga) and Siddhayogini. The left blind eye (bisdristi) of the goddess is the evil and poisonous eye, with which she can kill by her evil look, while she heals with the right nectar eye (amritanayan). Manasa is said to be kind and loving to their worship and merciless to those who reject her. Manasa is also mentioned in the Puranas. Mantras are Om Hrîm Srîm Manasâ Devyai Svâhâ and Om Hrîm Srîm Klîm Aim Manasâ Devyai Svâhâ. Her Bija is lim. In Buddhism, the snake symbolizes hatred and aggression (samsara). The goddess Janguli - Tara is the Tibetan goddess of snakes and poison. She is mostly yellow-skinned painted with three faces (one blue and one white) and six arms. She wears snakes and lotus flowers. Her powers can be used to prevent snake bites. In Egypt, Apophis is associated with the snake. A (mostly Uraus) snake also appears in many figures from the forehead of pharaohs and egyptian goddesses. The creator god Khnum has two snakes above his head, which correspond to the cosmic fluids Jin and Jang, on images next to the sun disk (Re) and the two plates above his head. Mehen was a serpent god, whose body was either heavily wounded or completely capped. He was often depicted as a fire. In spiritual alchemy is the Ouroborus et al. in the Book of Lambspring, 6 an ancient snake symbol. It is also found on ancient Egyptian coffins, in the gnosis, in emblematics, and in esoteric confederations. In the Aurea catea Homeri. Francoforti et Lipsiae. the Inferior Uroboros has satanic features, while the Superior Uroboros with wings and crown carries celestial or divine traits. In the Greek myths terrible snakes such as Echidna, Hydra and Python are known. In Crete, the Minoan snake goddesses were revered, who were mainly found in shrines outside the Knossos Palace. Because they wear a long skirt with exposed upper body and arms outstretched, they are less a fertility symbol. Some statues additionally have a small child (or animal) on their heads.